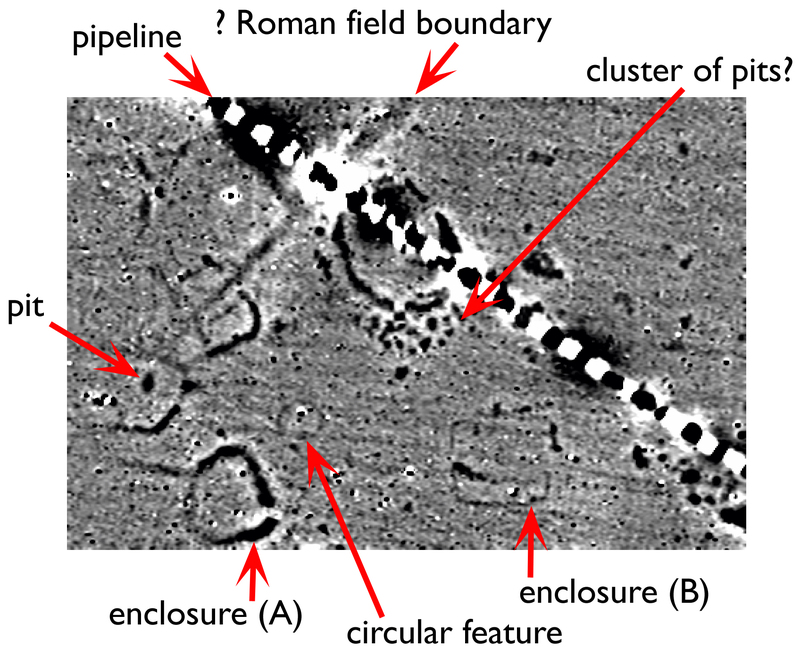 This page is intended as a quick overview of geophysical survey techniques in archaeology, mainly intended for those who have stumbled upon the Project’s blog and are wondering what it is all about. For anyone wishing more detail than this brief overview provides, I recommend John Gater and Chris Gaffney’s excellent introductory book: Revealing the buried past: geophysics for archaeologists (The History Press Ltd, 2003). 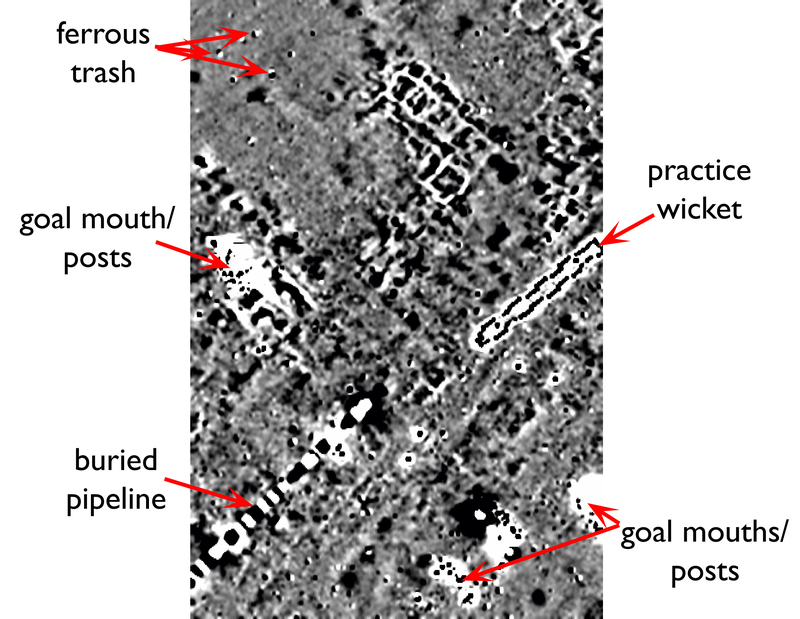 Geophysical survey techniques in archaeology seek to ascertain information about what lies beneath the surface without having to excavate. For many of the common techniques — but not all of them — this usually involves taking many measurements of some property of the soil. For example, how magnetic it is. Those measurements are used to create an image which will hopefully tell us something about what lies beneath. Traditionally, this has involved laying out grids on the site and then taking readings at regular intervals across that grid. 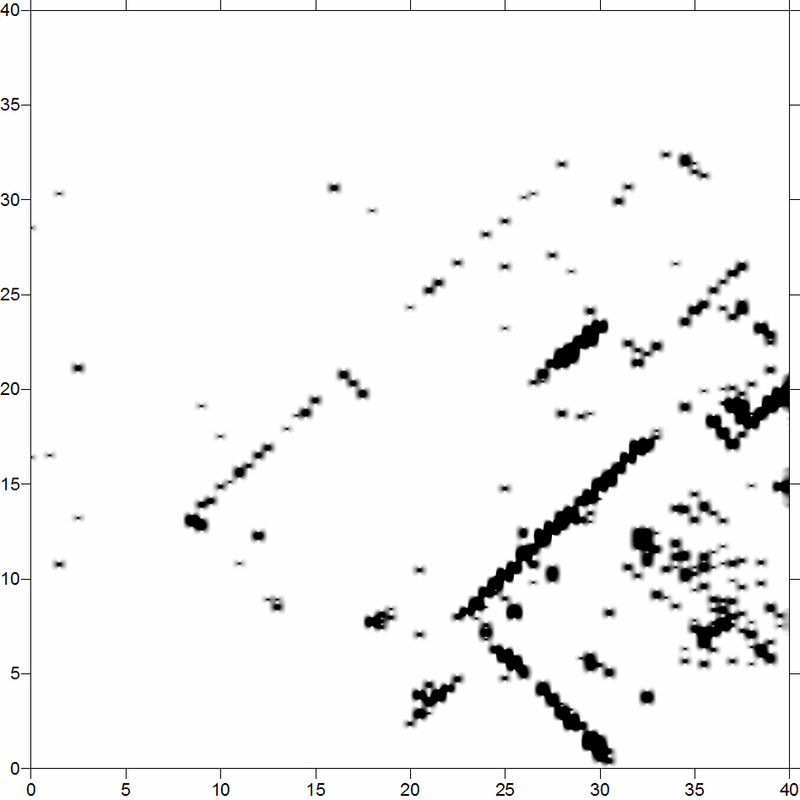 Those values are then plotted using appropriate software to create a map-like image. More recently, the use of high accuracy survey-grade GPS has freed us from having to use a grid, but at a cost. Survey-grade dGPS units are expensive to buy and also to run if one wants to use the Ordnance Survey “SmartNet” service to provide high accuracy data in the UK. As a result, many of us still survey in a regular grid. 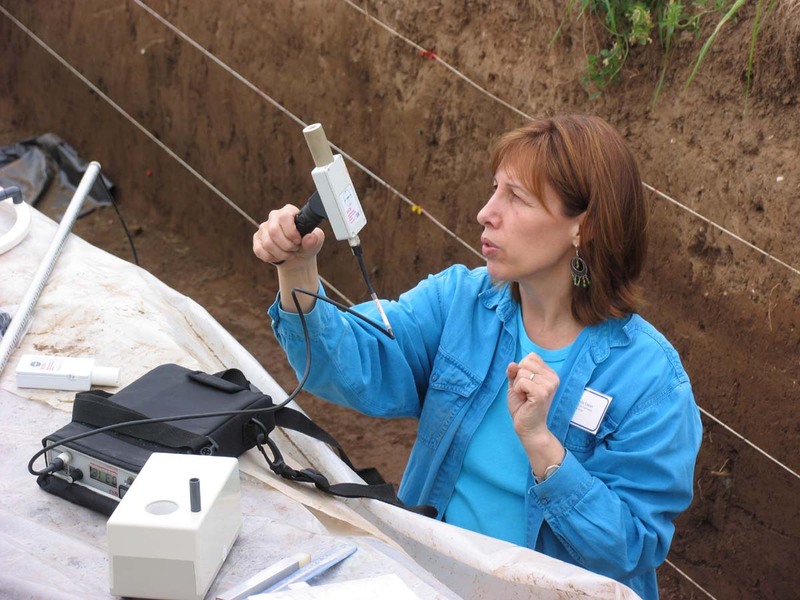 Different techniques will have varying degrees of success in detecting archaeological remains, depending on the nature of the soils and soil conditions, and the nature of the remains themselves. 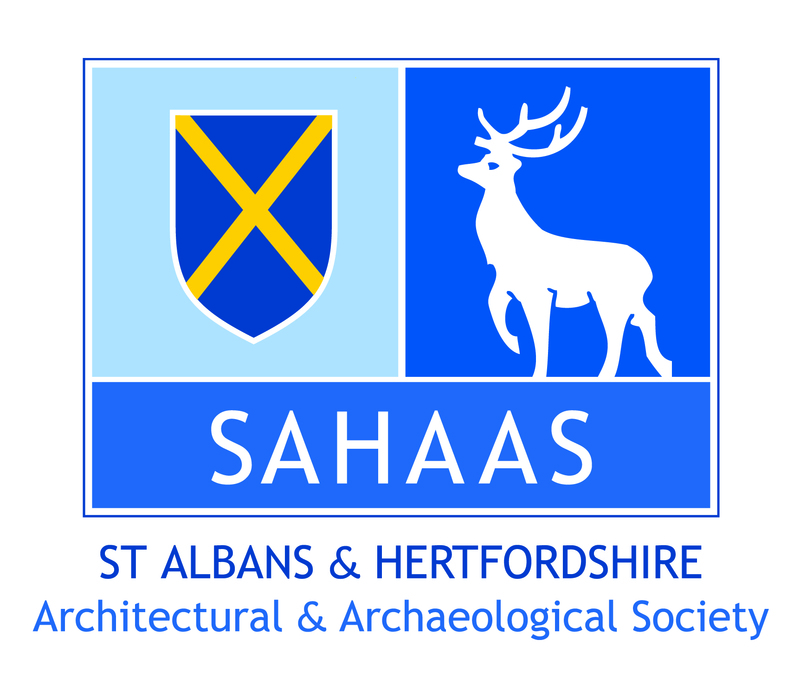 If the archaeologist has the luxury of being able to undertake several different types of survey on the same site, the combined results can be more informative than just using a single method. There are other methods but these are the main ones. This technique involves passing an electric current through the soil and measuring the earth’s resistance to it. In order to pass a current the soil must contain both water and salt. Generally, in the temperate climate of the UK, the salt distribution is of limited interest, but the variation in moisture is useful. Solid features such as stone walls and roads have less moisture and therefore a higher resistance, whereas pits and ditches will tend to pool moisture and have a lower resistance. In practice the method is usually better at identifying high-resistance type features and less successful at finding low-resistance features. One downside of resistance survey is that is it slow compared to the other methods, and usually we make-do with a low “data density”, i.e., the number of readings per meter. Often, surveys will be conducted at one reading per square meter, but for better results most of the surveys we do take four readings per square meter. Members of CVAHS operate a TRCIA resistance meter. In the image above we can see a mobile frame with two probes on it, and a long electrical cable on the end of which are two further probes stuck into the ground. One probe on the frame and one of the remote probes are passing the electrical current. The other two probes are measuring the “voltage potential” from which the resistance is calculated. By moving the frame along a string and inserting the probes at set intervals we can build-up an image of the pattern of resistance in the subsoil. 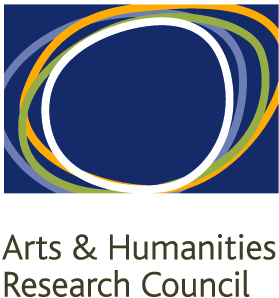 Resistance survey results from Gorhambury. On the left side of the image above, we can see one of the more successful resistance surveys we have undertaken, at Gorhambury. White represents areas of low resistance and darker shades areas of higher resistance. As water distribution in the soil is determined by many factors, as well as the archaeology, often there will be trends of light and dark against which the archaeological patterns can been seen. Luckily for us, Roman sites often have straight lines and right angles, which makes spotting the patterns easier. On the right-hand side I have plotted some of the more obvious walls. There are almost certainly more, especially in the darker area to the bottom right. The geology of Hertfordshire is such that resistance surveys are not always all that revealing archaeologically, but at Verulamium it is adding a useful extra data set. The results of a survey will also vary with the time of year. If everything is too wet, or too dry, nothing will show. Resistance survey is popular with local groups as the TRCIA machine was available relatively cheaply, but it is often not the best technique to use first. It is slow to collect enough data to make sense of a survey and it is heavily affected by the season and recent weather. Also, it can be hard, if not impossible to join parts of a survey together if they were undertaken at different times. As the name suggests, magnetometry is measuring magnetism. But why is that of use to archaeologists? There are two sources of magnetism which are helpful to us. Firstly, when sediments are subject to intense heat, the iron particles in them align on the Earth’s magnetic field. The fired sediment is thus weakly magnetic. If the sediment remains in situ, it is possible to measure the angle of magnetic north at the date the sediment was fired, and estimate the age of a feature like a hearth or kiln. This is the basis of archaeomagnetic dating. For our purposes, however, in situ burnt features, such as pottery kilns, are highly magnetic and easy to detect. Burnt material in the soil, however, will also generally increase how magnetic those soils are. Secondly, decayed organic material is generally slightly magnetic, but too weak to detect easily unless placed in a magnetic field. Luckily, we are standing on the something which generates a strong magnetic field, the planet Earth. Where we have negative features, such as ditches and pits, that contain more organic soils than the surrounding subsoil, we can detect those features. However, a negative feature that was filled with sediment similar to the subsoil, for example a pit which was dug then quickly backfilled, may not be detectable. The Foerster magnetometer in use. The Earth’s magnetic field is, however, very strong compared to the archaeological features we are trying to detect. It also fluctuates! The solution to this problem is to take two measurements simultaneously, one near the ground and one higher up, and to subtract the latter from the former. In the image above we can see four vertical cylinders mounted on the front of the cart. Each of these has a magnetic sensor at its base and at the top. This type of magnetometer is known as a gradiometer. The four sensors are each collecting a single line of data, so that with every pass of the machine we are collecting four lines of data 0.5m apart, with 10 readings per meter along the line, i.e., 20 readings per meter square. Distance is measured via an odometer — you can just see the white cog on the right-hand wheel. As we have to simply walk back and forth following the guide strings, survey is quick. We can often complete a 40x40m grid square in 30 minutes, compared to a whole day for the same area with the resistance meter. The main downside of magnetometry is that anything ferrous will show very strongly in the data. We have to be very careful not to wear shoes with a steel shank in the sole. Also, iron in the ground, such as old pipes, tractor nuts and horseshoes will show strongly, as will fence lines, goal posts and other ferrous items. 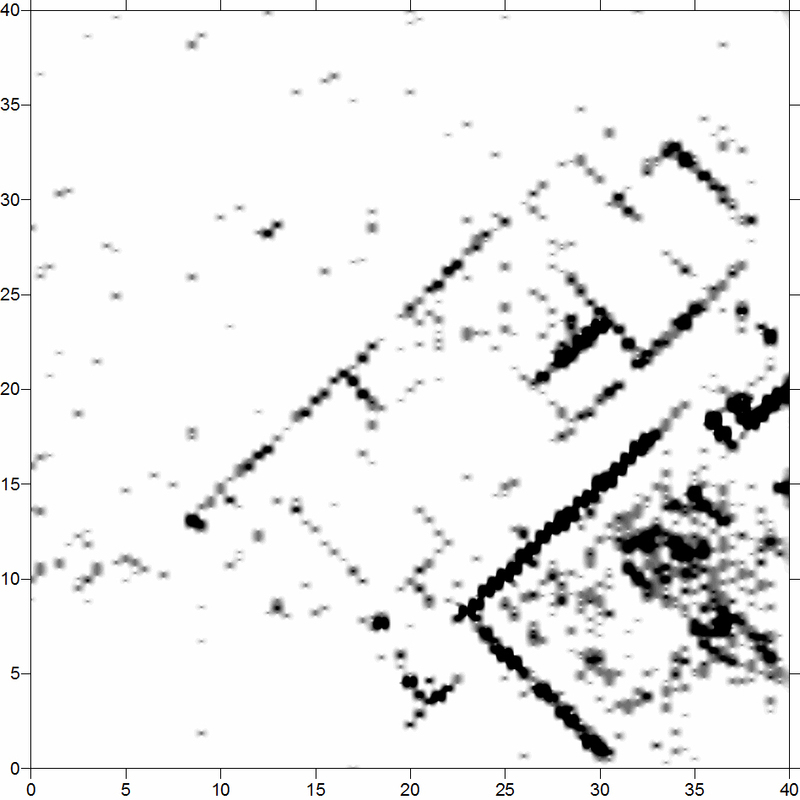 As a result, magnetometry tends to be difficult to use on historic sites due to the ubiquity of iron artefacts. 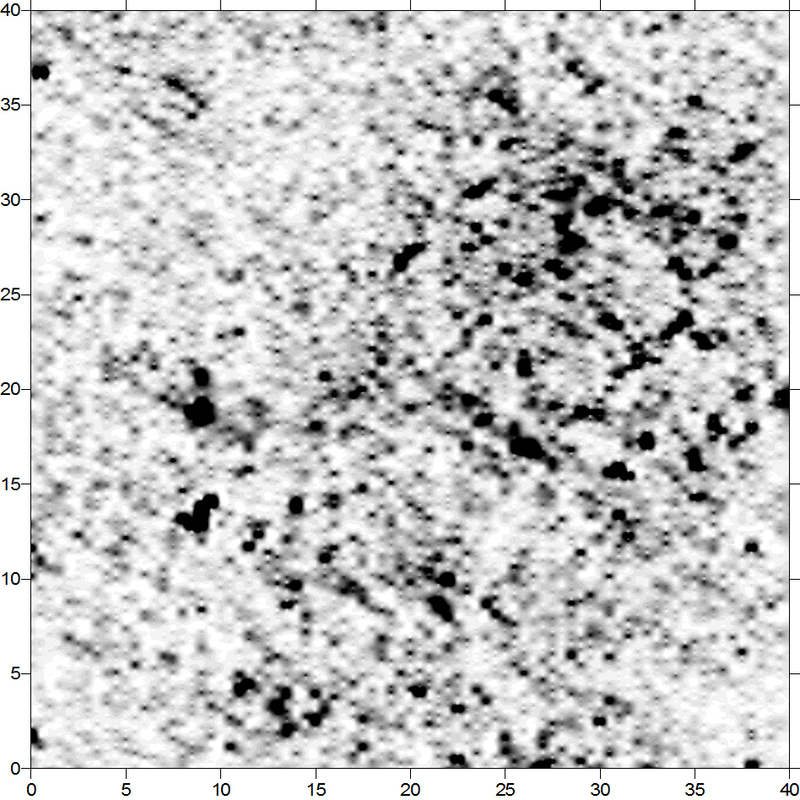 Some typical types of ferrous noise in magnetometry data. In a typical gradiometer survey, the machine is set so that the background level of magnetism reads as zero. As one passes over magnetic features, the machine will record both the positive and negative poles of the feature as positive and negative readings in nanoteslas (nT). Most archaeological features will be weak with readings lying perhaps between -10nT and 10nT. Iron objects, however, are likely to be many hundreds of nT, if not thousands. In order to see the archaeology in the image, we have to clip it. 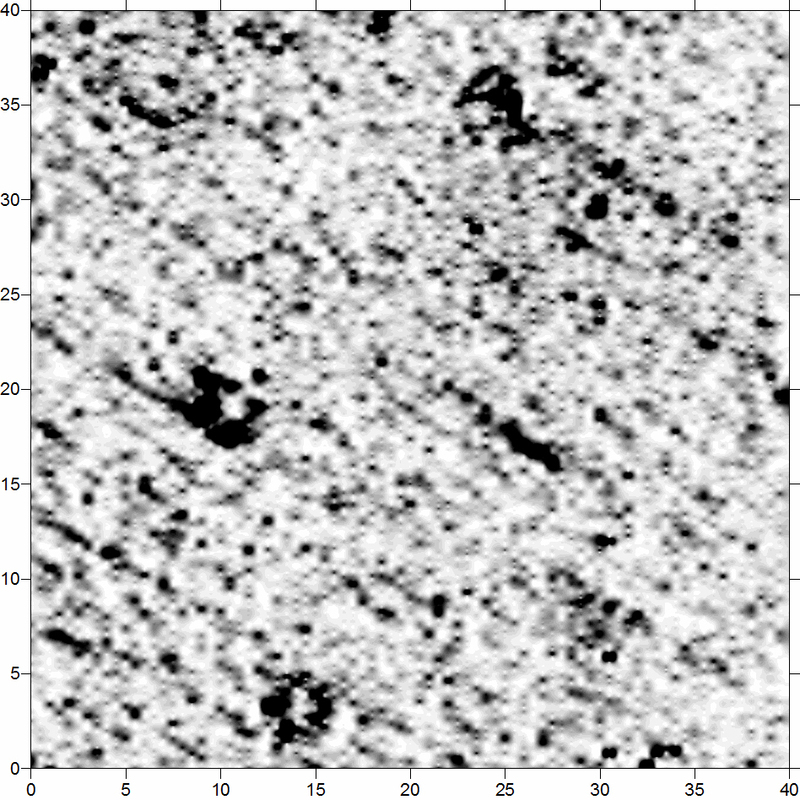 In the image above, anything below -10nT is shown white, and anything above 10nT is shown as solid black. As a result, modern ferrous noise shows in stark black and white. This example, taken from our survey in Verulamium Park, shows a variety of different types of feature. Pipelines are especially distinctive as linear features alternating black and white. When undertaking a survey, one has to take note of any modern features one sees that will impact the results. 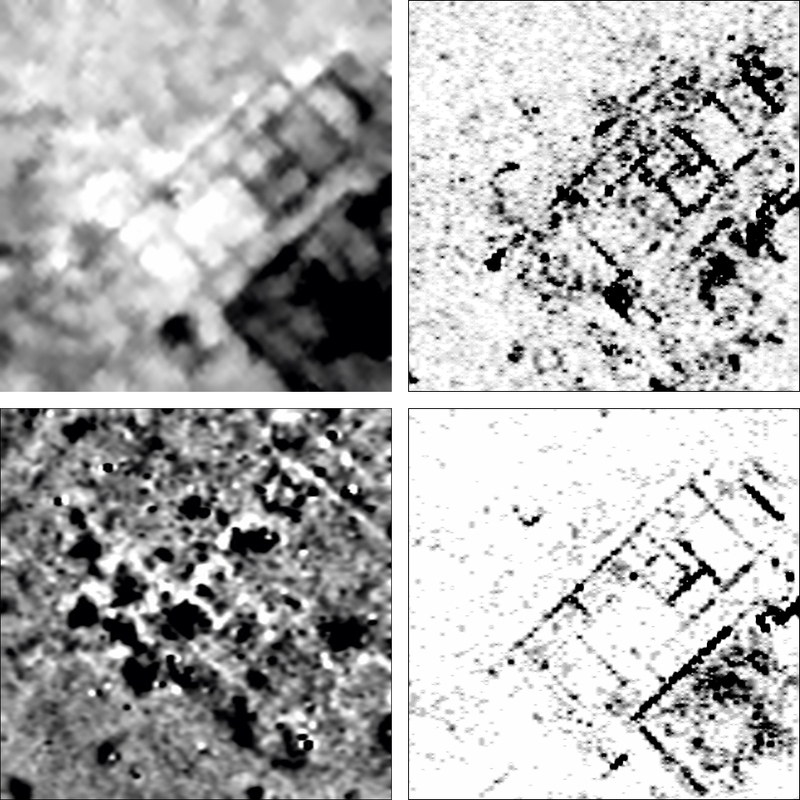 For example, the practice cricket wicket in the above image is clearly a modern feature, but without having seen it during the survey I would have been hard put to guess what it was. 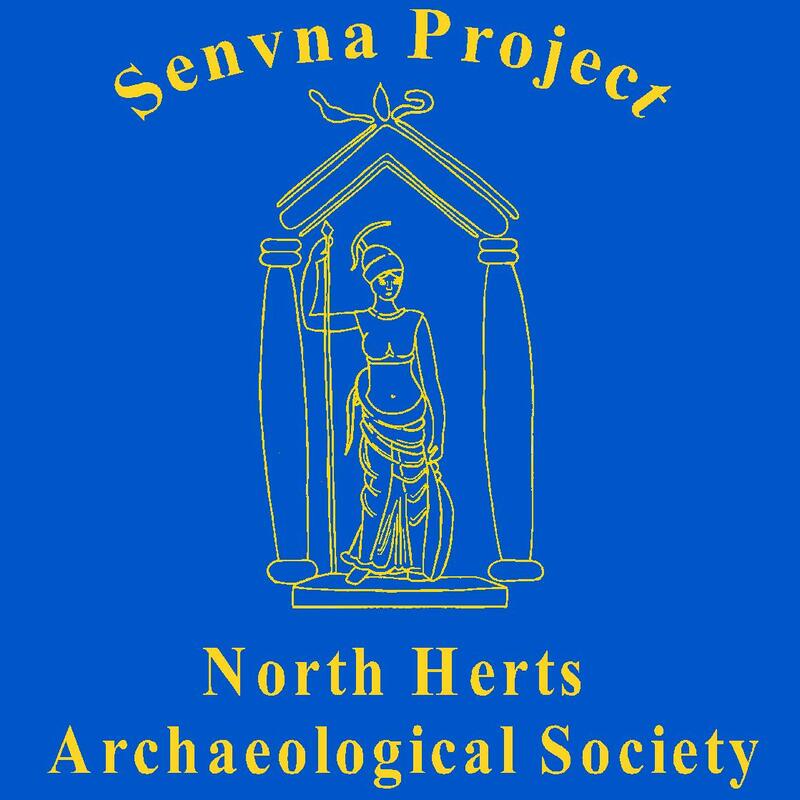 Detail of the survey in the southern part of Verulamium showing a pottery kiln. 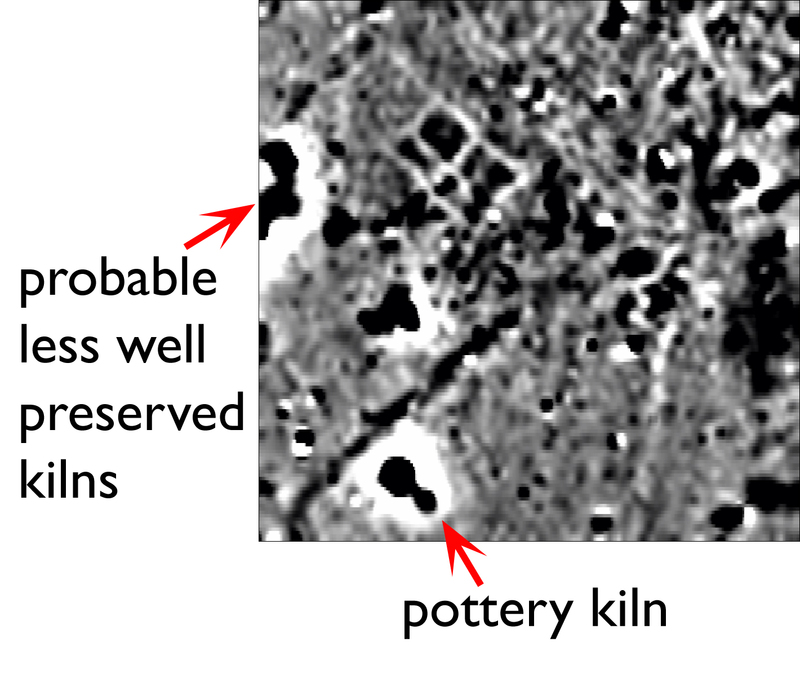 Some archaeological features can be strongly magnetic, however, such as pottery kilns. In the above image, the kiln was recognised because of its form which is well known from excavated examples. It also helps that Verulamium is known to have had a pottery industry in the first and second centuries AD. A 120m by 80m detail of the magnetometry survey from Great Buttway, Ashwell End. What about more subtle features? 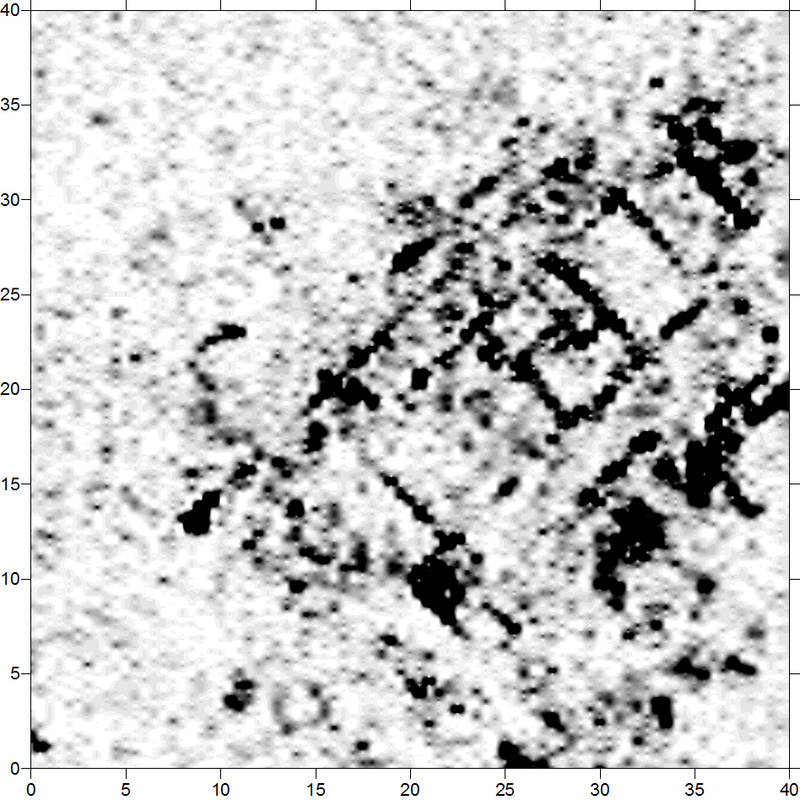 In the above image, part of the survey from Ashwell End, I have marked some of the identifiable archaeological features visible. The strong black-and-white line is a pipe, as we saw above. Frustratingly (and typically! ), the pipeline goes through the middle of an oval feature, probably some form of enclosure ditch. There are several other features visible. Enclosure A is clear with an east-facing entrance. Why is the ditch so faint in the SW quadrant? It may be because the ditch was much shallower here, or has been ploughed out more. Alternatively, it may have had less burnt and organic material dumped into it, or may have been backfilled quite quickly with soil similar to the subsoil. Enclosure B is much fainter and thinner, but is still quite clear in the data. The circular feature is much smaller, about 7.5m by 6.25m. It might be a round house, but it isn’t very round! What about stone walls? In Hertfordshire our only building stone is flint, which is non-magnetic. We shouldn’t be able to find flint walls. The exception occurs when the surrounding soils are quite magnetic. We set our machines to read the average background as zero nT. Flint walls, or even just the foundation trenches for them when the flint has been robbed, may have resulted in the removal of some of the magnetic soil. Therefore they show as negative features, i.e., in white in the plots used in this blog. The building seen in the NW quadrant of Verulamium. In the above image, the walls of the building shown by the lines of white are really quite clear. Not everything is quite so easy, however. Sometimes the magnetic material has filled in robbed walls once more, sometimes other magnetic features help obscure the patterns. 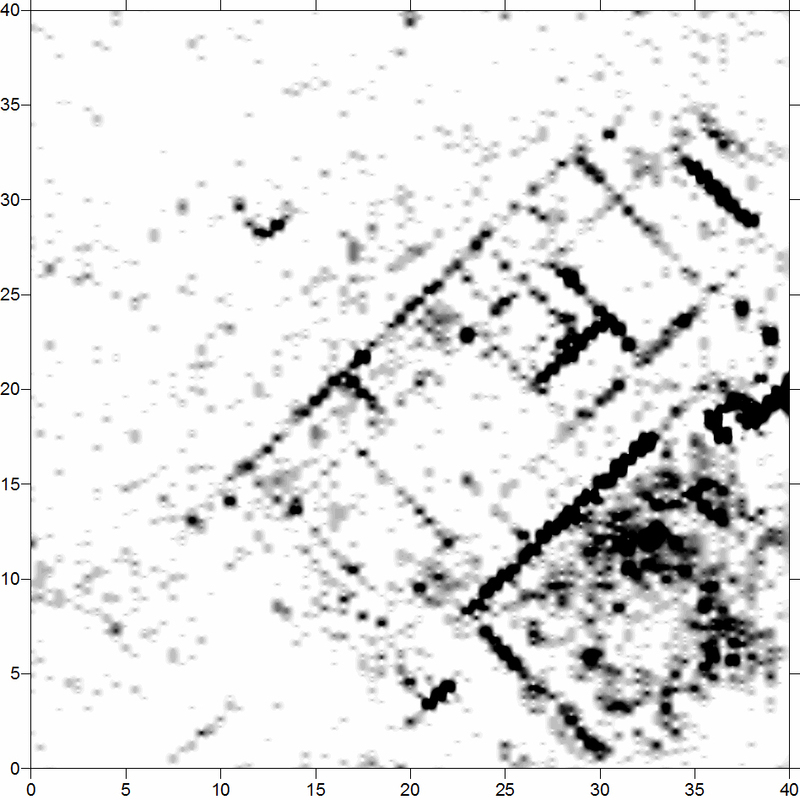 The next image compares the building shown in the Earth Resistance data above compared to the magnetic data. As can be seen, there are some overlaps, but the reality of the archaeological remains is clearly quite complex and the two techniques compared give different parts of the story. Admittedly, my tracing of the archaeological features is quite rough-and-ready and incomplete, but it gives one an idea of the complexities. 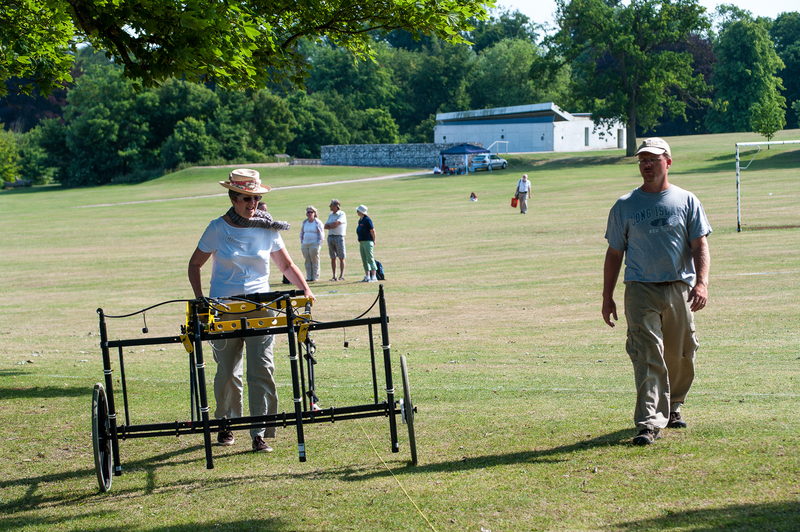 Ground Penetrating Radar (GPR) is an active technique in that we are firing a radar wave into the ground, and recording the signals that bounce back. The radar unit we have access to, thanks to SEAHA, is made by Malå Geosciences. The system consists of a radar antenna, which transmits and receives the signal, a cart for easy data collection, and a control unit — essentially a rugged computer which is attached to the handle of the cart (see the image below). John Dent (SAHAAS) operates SEAHA’s Mala GPR. To collect data we push (or in some configurations pull) the antenna across the ground surface in a series of parallel lines. 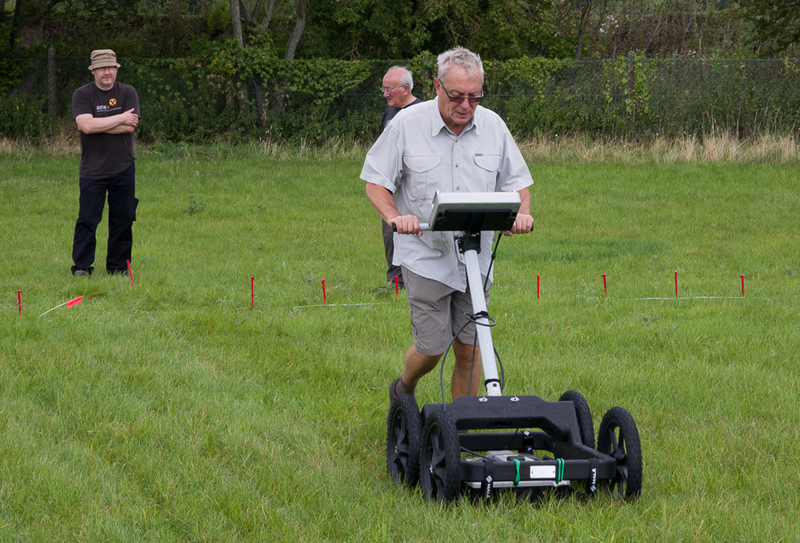 An odometer on the cart (or a trailing wheel on a pulled system) triggers the GPR to send an high frequency electromagnetic radio (radar) pulse into the ground. In our case we have it set to do this every 3.5cm. 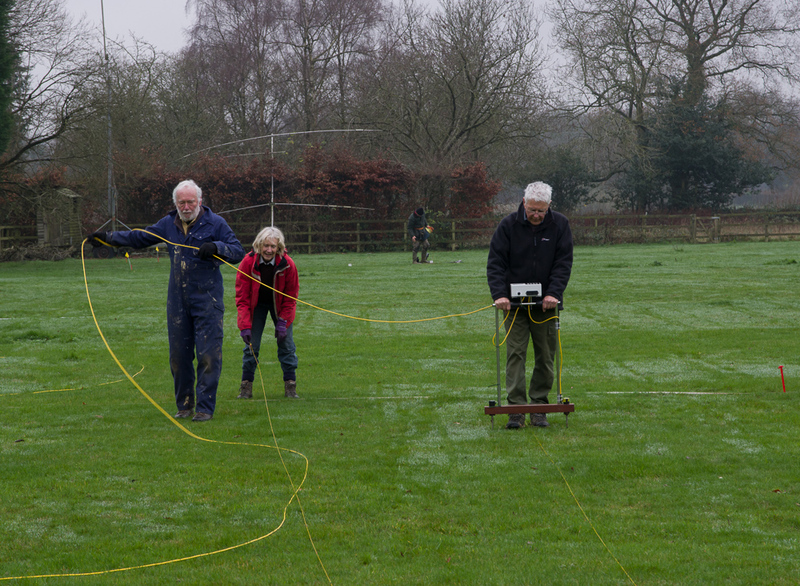 For our surveys we are generally using lines 50cm apart (as in the above image) although at times we have used lines 25cm apart for better resolution, or 1m apart for greater speed. The pulse will reflect off a buried discontinuity, such as a change from soil to a stone wall. The strength of the returning wave, and the time lapse since the pulse, will be recorded by the antenna/control unit. Reflections can be caused by all sorts of changes, for example by the water table, rocks, holes, and so forth. For most of the surveys CAGG undertakes, we are largely detecting “solid” features such as walls. We have, however, picked-up the lines around a football pitch! As part of the signal will pass through the discontinuity, we may well get several reflections at different depths. By measuring the time taken for the radar wave to travel there and back, it is possible to calculate the depth at which the features are buried. 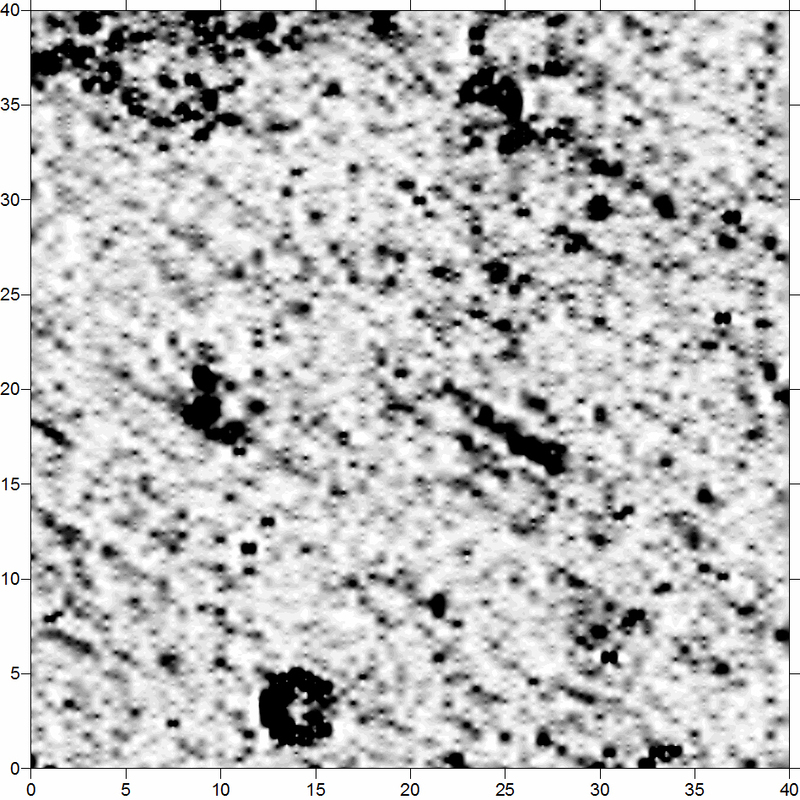 GPR, therefore, gives us a more instant “3D” image than the other techniques (although it is possible to look at different depths, etc., with other methods with a bit more effort). Each line of data we collect produces an image of the reflections along that line called a radargram. These are quite hard to understand! I have discussed these before in the blog. It is a vertical slice into the ground with distance along the transect going from left to right, time in nanoseconds going from top-to bottom, and the strength of the reflection shown in shades of grey. The radargrams require data processing to bring out the details. I will not go into those steps here. The processed radargram of line 1893. In this processed radargram, the blank grey block at the top is the “air gap” between the antenna and the ground surface that is just loud noise. It has been processed out. The part marked “ring” is a mushroom ring. These retain moisture and therefore reflect more of the radar pulse than the grass. The black and white banding is essentially the “echo” of that initial reflection. The relatively quiet zone between the top grey and the main band of signals is probably the topsoil. 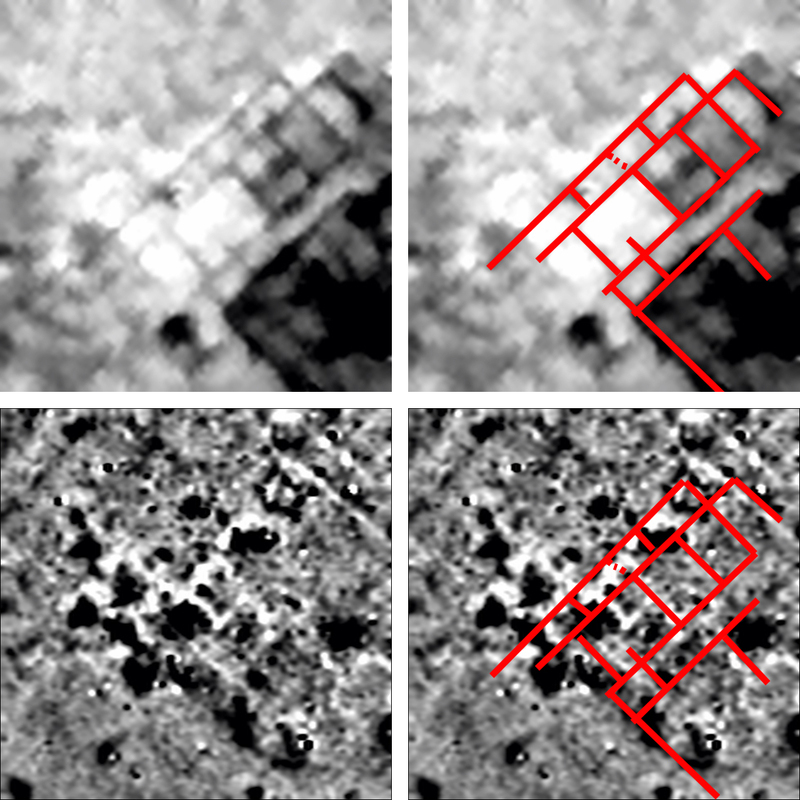 The wall is marked and can be seen quite clearly in this radargram, again as a series of echos down from the top surface of the wall. It used to be that at the end of a survey one would have lots of these, and one would carefully map the returns on the vertical slices, then transfer those to a map of the site. Luckily, this process is now built into the software, and is called time slicing (or sometimes amplitude slicing). Imagine the site is a cake. Normally we cut the cake and look at it in sections, seeing the layers of sponge, jam and cream. Those are our radargrams. Now imagine slicing the cake horizontally. The first slice, and maybe the next couple, would be all sponge. Then we would get a slice that is all jam; then more sponge, then a slice of cream, and so on. Those would be our time-slices. Seems an odd way to look at a cake, but with an archaeological site we do not only want to see the vertical slices, we also want the plan. I have processed the same 40x40m block we have seen with the resistance and magnetometer data above, creating eight time slices each of which are 2 nanoseconds (ns) in thickness. Time slice from 9 to 11ns. The first slice, shown above, shows some circular features — the one towards the bottom is quite strong. These are mushroom circles. 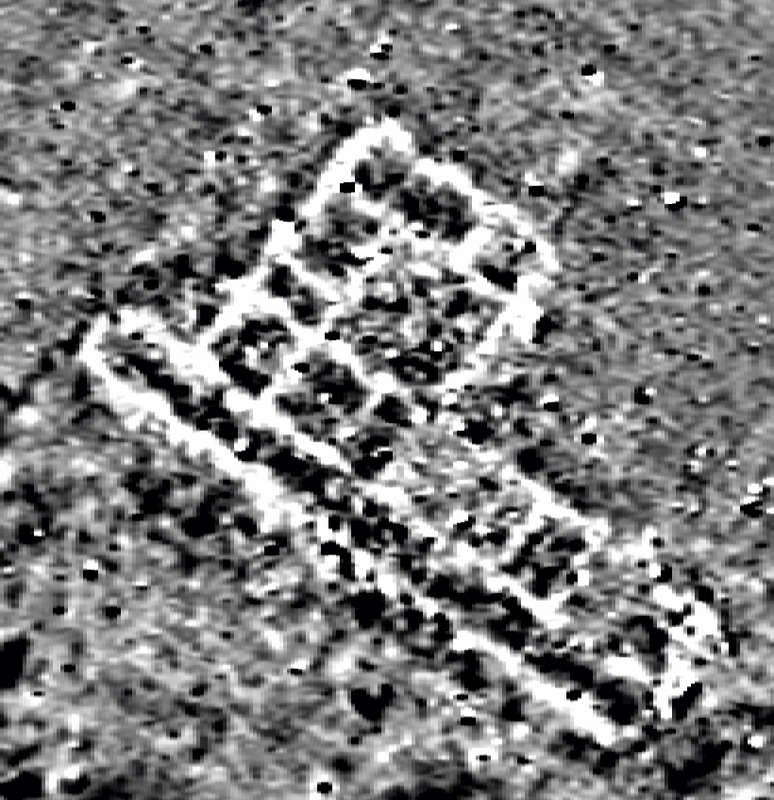 The vaguely linear pattern running at a slight slope downwards from left to right are cultivation marks. We are very much still in the topsoil here. Time slice from 11 to 13ns. The next slice down is not showing anything much new. The mushroom circles are fainter as they mainly hold moisture towards the surface. Time slice from 13 to 15ns. Still nothing very clear, but there are faint hints of linear features in the stronger (darker) reflections especially in the top-right corner. Hints of things to come, maybe? Time slice from 15 to 17ns. Now we are getting there. In this time slice we can see walls showing quite clearly as linear features of strong reflections plotted in black. We may even have some surviving floors. In general, large flat things don’t always show well in the time slices but they will show in the radargrams. A full analysis of the data, much fuller than I ever show in the blog, would swap back-and-forth between the horizontal slices and the vertical radargrams. Also notice that the strong circular mushroom ring that showed so well in the first slice still shows in this one as a faint echo. Time slice from 17 to 19ns. We can see some more of the walls of the building. There appears to be a large surface to the SE, a courtyard perhaps? The possible floor, which showed in the previous slice at about 20m across, does not show in this slice. We have probably gone through it. Time slice from 19 to 21ns. Another slice down and some of the walls are fading out. We are getting below them. The wall around the potential courtyard in the SE corner is showing much more strongly. Notice how the image is becoming more starkly black and white. The radar signal is “attenuating” and getting rather weak. Much of the image consists of blank areas now with little or no radar response. The “courtyard” wall is still showing strongly, however, and there are continuing suggestions of a hard surface in the SE corner. Time slice from 23 to 25ns. This last slice is now almost all blank, but a few of the walls are still showing strongly. The image has been reduced to almost pure black-and-white. How deep are these slices? Unfortunately, the software I have access to makes estimating the depth a little tricky. If, however, the top three slices represent the ploughsoil, which is probably about 30cm think, I would guess that each slice is about 10cm and we are only getting down about 80cm in total. This isn’t very deep for GPR which can, in the right soils, go down a very long way. Luckily for us, most of the sites we are interested in lie just below the plough zone, so it’ll do! How does this compare to the other methods? Comparison of the Earth Resistance data (top left), the magnetometry (bottom left), the 15–17ns time slice (top right) and the 19–21ns time slice (bottom left). Combining the various data sets to provide a comprehensive interpretation of the building is quite a challenge, but having all three data sets provides many more clues than just having the one. Magnetometry, as discussed above, is a passive technique measuring local variations in magnetism against a localised zero value. Magnetic susceptibility survey is an active technique: it is a measure of how magnetic a sample of sediment could be in the presence of a magnetic field. How much soil is tested depends on the diameter of the test coil: it can be very small or it can be relatively large. Rinita Dalan with the Bartington magnetic susceptibility meter. The sensor in this case is very small and samples a tiny sample of soil. 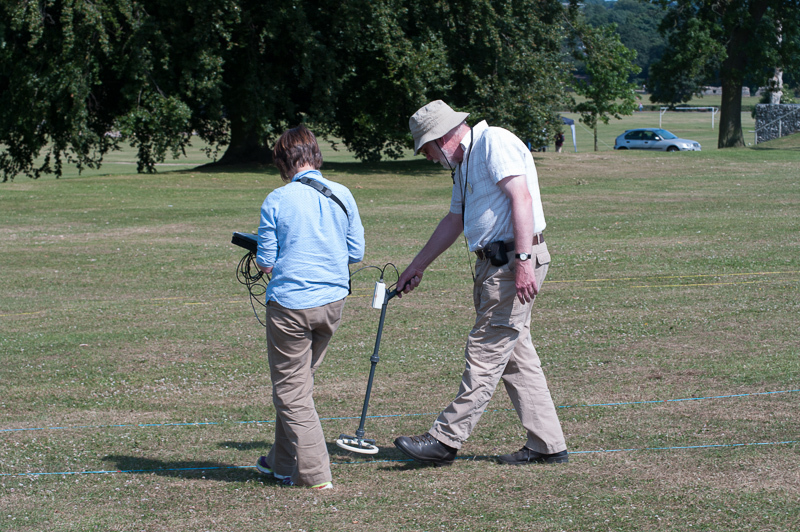 The Bartington magnetic susceptibility meter with a large “field coil” in use at Verulamium during the course in 2013. Top soil will be magnetically enhanced compared to subsoils simply due to natural oxidation and reduction. The presence, however, of human activity usually enhances the magnetic susceptibility of the sediments because of the addition of burnt material and organics. By measuring magnetic susceptibility at a relatively coarse scale, we can detect areas of human occupation and middens. Unfortunately, we do not have access to a reliable mag sus meter, but Jarrod Burks (who helped teach at the course in 2013) has some excellent examples. One of which is the Wildcat site in Ohio. The site is a village belonging to the Fort Ancient “culture”. 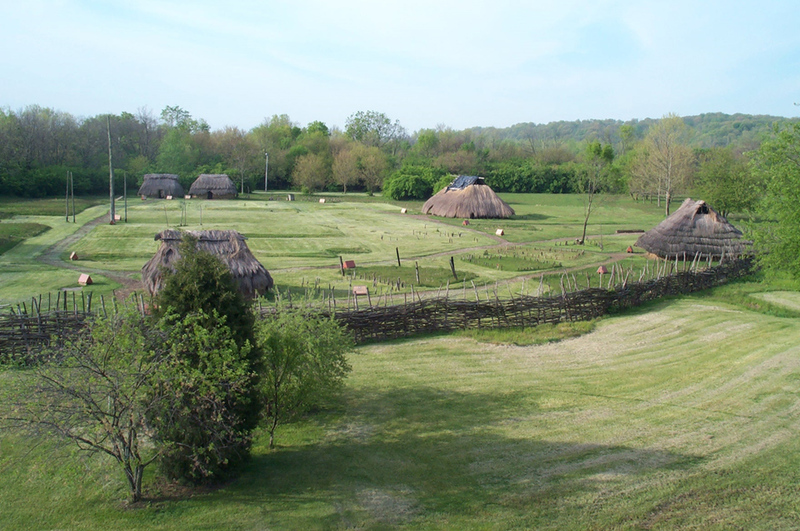 These villages are often laid out around a central open area or plaza, such as this reconstructed example at Sunwatch, Dayton, Ohio. Sunwatch Village, Dayton, Ohio (photo: Jarrod Burks). 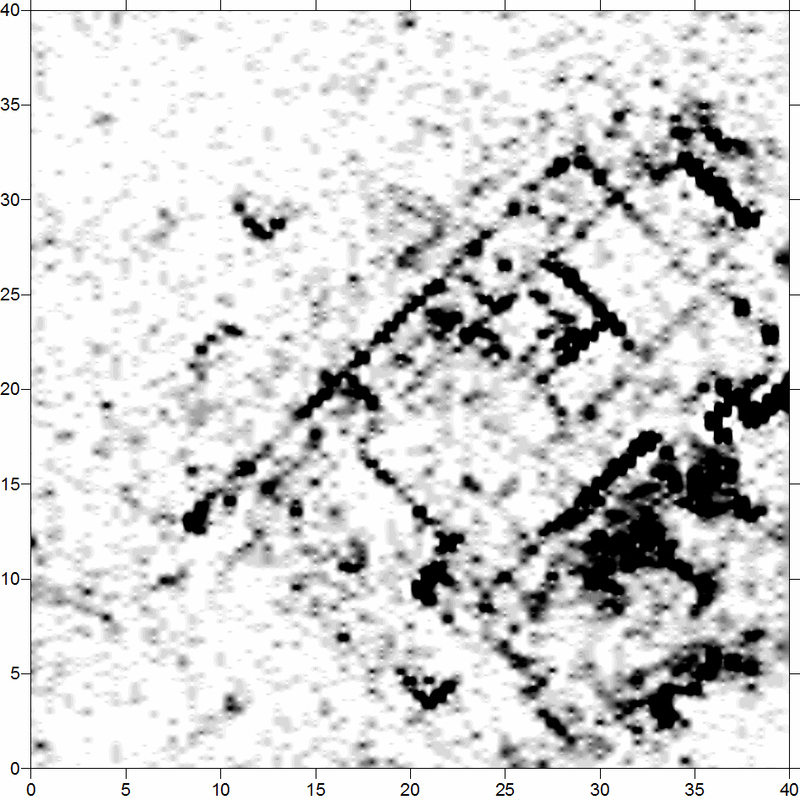 At the Wildcat site, the magnetometer survey had located a variety of features and houses. The magnetic susceptibility survey helped, however, define the main area of occupation and midden which surrounded the more open area. 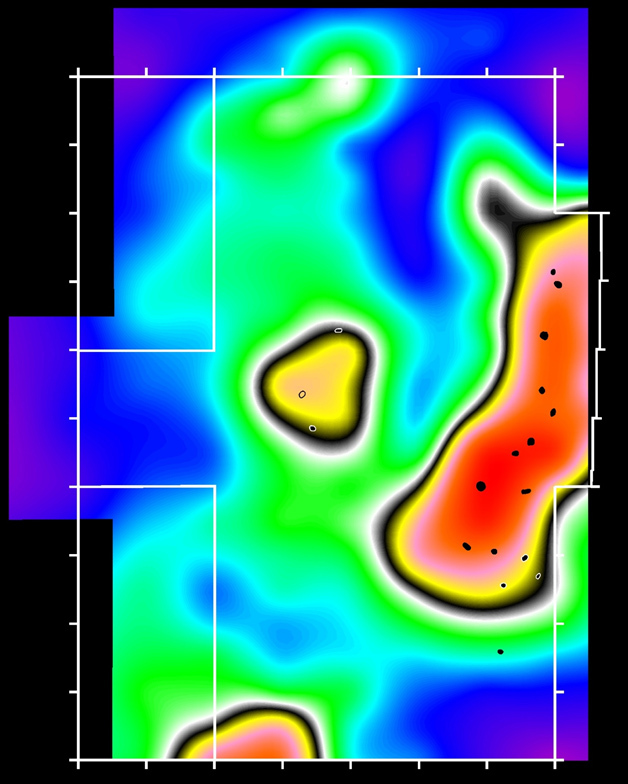 In the next image the red area is the high magnetic susceptibility readings, which correlated well the with archaeological features. Jarrod Burks’ magnetic susceptibility survey results from the Wildcat site, Ohio. Red is high, blue is low. The technique is therefore of great use in defining areas of general occupation rather than identifying specific features.